What are the best seats in the 3 Arena Dublin? In the fully seated layout the best seats in the 3 Arena Dublin (formerly known as the O2 Arena) are the first front rows in the ground floor blocks. 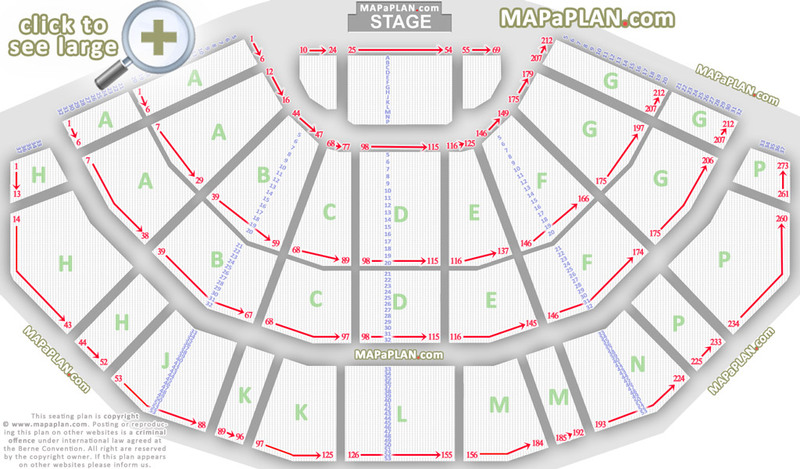 The seats are numbered from 10 to 69 so try to pick tickets as close to seat #40 for a nice central view of the stage. The ground floor rows are numbered alphabetically from A to P. The floor is flat so the view may be slightly obstructed/restricted if a tall person is sitting (or standing) in front of you. The first rows in the tiered blocks A, B, C, D, E, F, G offer great view as well. 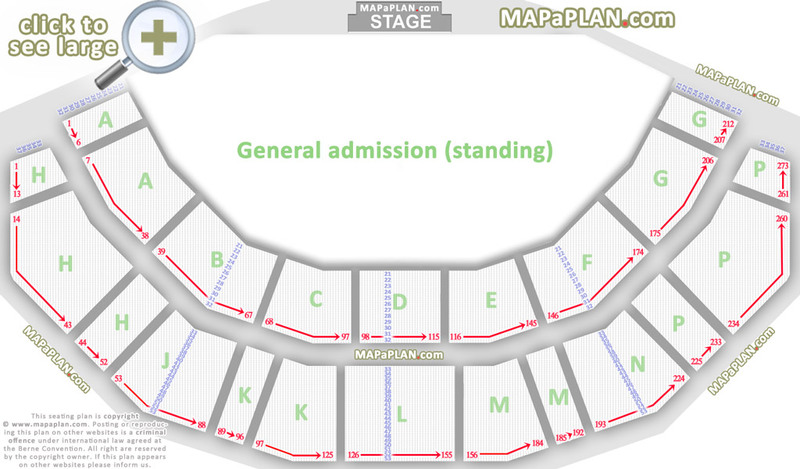 The top seats are numbered 98-115 in rows 5-10 in block D. Rows 5 to 20 are set on retractable platforms which is withdrawn for some events to create a large general admission (ground floor standing) area. Scroll down this page to see this arrangement. The upper tier blocks H, J, K, L, M, N, P offer good view as well. The tiered seating in the O2 Arena forms a gigantic horseshoe (amphitheatre) layout which means that the back rows in these blocks are much closer to the stage than the back rows in stadiums or sports venues which typically are very long and rectangular. You are quite close to the action even in the back rows, however for the best experience try to find seats close to seat #140 in the first rows of block L. Below you can find an actual photo where all the blocks have been highlighted. This should be very helpful when deciding which tickets to buy. What are the block numbers in the 3Arena Dublin? The block are numbered as follows: Flat seating, Blook A, Block B, Block C, Block D, Block E, Block F, Block G, Block H, Block J, Block K, Block L, Block M, Block N, Block P.
How are the rows numbered in the 3Arena Dublin (O2 Arena)? The rows in the flat seating block are numbered alphabetically: Row A, Row B, Row C, Row D, Row E, Row F, Row G, Row H, Row J, Row K, Row L, Row M, Row N, Row P.
The rows in the tiered seating blocks are numbered in the following way: Row 5, 6, 7, 8, 9, 10, 11, 12, 13, 14, 15, 16, 17, 18, 19, 20, 21, 22, 23, 24, 25, 26, 27, 28, 29, 30, 31, 32, 33, 34, 35, 36, 37, 38, 39, 40, 41, 42, 43, 44, 45, 46, 47, 48, 49, 50, 51, 52, 53. What are some of the biggest acts that will be performing or have performed at the 3Arena Dublin (O2 Arena)?